1. Supposedly Texans do everything bigger, but Peruvians are REALLY the ones who do it bigger: they sell 5 kilo bags of rice, 7 liter bottles of water, and my favorite: the biggest chicarones, as in the size of the entire pig! 2. Stray dogs outnumber homeless people by far, we tried to count one day and just gave up. I had never seen so many! They would gather together at the piles of garbage on the street and dig through everything. They were friendly for the most part. Vince made friends with a poor guy who had been neglected so long he had dreadlocks hanging from his ears. We fed the dogs our extra chicken and bought some actual dog food for them, but they would never eat it out of our hand or even if we were nearby, they preferred to get it for themselves. 3. In Lima you can exchange money in the street. I always went to an ATM because it felt safer, but there are lots of people that do it this way. In any case, never exchange money in the airport- they charge you tremendous fees! 4. One area where Peru is CERTAINLY not lacking is gastronomy. From street food to 5 star restaurants, they have the most distinguished culinary elements of anywhere we have been. They boast the world’s leading chef and 2 of the top 10 best restaurants in the world. In Cusco we ate street food most often, which is cheap and delicious. For $1 per person we could buy 2 meat and potato kebabs with sauce and a drink- or switch it up and go for some salchipapas (fries with sauces and sausage on top), or maybe even a hardy breakfast of beef, eggs, potatoes, rice and hot tea- also for just a buck. Ice cream and dozens of cakes and pastries are sold on every corner for $.25-50. I’ll tell you, this is one place you will never go hungry! The only thing you have to be careful of is anything that may have been washed in tap water. We steer clear of precut fruits they sell because we simply don’t know what kind of water it was washed in (or if it was washed at all). In restaurants we never had an issue because even most of the locals do not drink the water, so drinks are always served without ice and made with bottled or boiled water. We tried alpaca and ceviche, and I was incredibly pleasantly surprised with both. The one thing I couldn't quite get on board with was the guinea pig. I may have been more inclined to try it if it wasn’t laying there with its claws and teeth still in its head, but it is considered a delicacy in Peru and people eat it during holidays. Chicha morada is another favorite. It is a drink made with purple corn, pineapple, and lime juice and I have been obsessed ever since I landed in Peru. The other largely popular drink in Peru is the Pisco Sour. Pisco is a brandy made from grapes and by itself is an extremely strong liquor – 48% percent alcohol or about 98 proof (we had to try it though, I mean when in Peru...!). The Pisco Sour is traditionally made with lime, sugar and egg whites with variations including passion fruit (my fav) and many other fruit flavors. 5. In Peru taxis can actually be cheaper than Ubers. BUT there is a limit! It is only cheaper if you are riding a short distance; anything more than a few miles and Uber is the way to go. However, in Cusco you cannot schedule a ride ahead of time, which almost forces you to pay the steep prices for those early morning airport/bus station rides. In Lima there are things called moto taxis (known as tuk tuks in other parts of the world) that are best suited for short trips and few people. 6. In Cusco especially, their religion is a mix between Catholicism and Incan tradition. 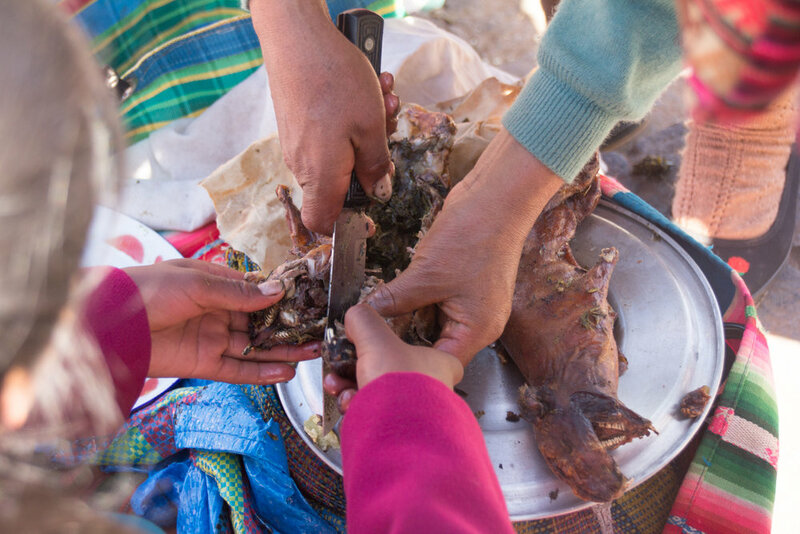 Even the painting of The Last Supper in Peru has the disciples eating guinea pig, in an effort to preserve Incan culture. Variations of this painting can be seen inside many churches and dining rooms. The Incas believe in 3 levels of existence in the world. The first, symbolized by the snake, represents the underworld or death. The second is the present, human life, and is symbolized by the jaguar. The highest represents the celestial/spiritual plane of the gods, and is symbolized by the condor. Many people believe in the power of Shamans and their ability to lift and cast curses on people. They are also known for leading people through a healing spiritual experience and altered state of consciousness by drinking Ayahuasca. Ayahuasca causes you to hallucinate and vomit profusely while under its effects. It is for this reason that some people use it for healing purposes aside from the spiritual experience, believing that it rids the body of parasites. During the hallucination most people often see the same type of patterns and designs. These patterns as well as the 3 animals representing the levels of existence, are largely present in Peruvian art. These elements can be observed in murals, street art, and in hand made goods found in markets. Many people in Cusco and the surrounding areas still follow this system of beliefs. They make offerings to several gods for things like safe travels or good crops, but also attend Catholic church and celebrate Catholic ceremonies and holidays. This is not a Shaman, but he is dressed similarly to how a Shaman might dress. 7. While in the US negotiating a price can sometimes be insulting, because we have more of a take it or leave it type attitude. Here negotiating is the norm and people mark up the prices slightly, expecting this. I got pretty good at doing this and was able to get deals on a lot of stuff. Not just taxi rides, food on the streets or little markets, but also in malls and actual stores. Sometimes it works and sometimes it doesn’t, but you can’t be afraid to walk away! 8. Along those same lines, people will sell anything on the street just to try and make some money. From brooms to paintings, and combs to toilet paper. We found it best to just not pay attention to these people because they will follow you around and bother you to the point that you have to yell at them to leave you alone. 9. In the US, generally stores of the same type are spread apart because you don’t want your biggest competitor right next door. However in Cusco, I noticed that all the hardware stores are in a row, the markets are all together, the pollerias (chicken restaurants) take up an entire street, and the copy places and pharmacies all sit side by side. It makes it easy for the customer to seek out the best deal, and convenient to find what you’re looking for without driving all over town. It just struck me as odd! 10. For being one of the 7 Wonders of the World, getting Machu Picchu ticket is not an easy task (unless you want to go with a tour group, which is pricy). The website is difficult to find first off, complicated to navigate, hard to understand, and doesn’t work half of the time. I literally had to follow steps given by another blogger that had the same trouble, and wrote a post to help everyone else out. After getting through everything it told me that student tickets (a $20 difference) could not be purchased online anymore, but gave a list of travel agencies that sold official tickets. The list was hundreds of names long with no order to it, no location listing, and no way to search through it. I couldn’t ever find a place in Lima that could sell student tickets- and believe me; we went to every travel agency within a 5-mile radius. Finally I just said we would wait until we got to Cusco to buy them. The trick is, the address online is not the correct address. Upon arrival the guy sent us away with no direction or name of where we could buy them. We were so close to spending hundreds of dollars on a tour when finally I started popping my head into every store asking where I could buy them. Finally we ended up in the right building and then we followed the signs and still got lost looking for the office. After more help from strangers our journey finally ended and we were able to purchase the tickets for the following week without hiring a guide. The next step was to buy the train tickets to get to Machu Picchu. The guy we bought our Machu Picchu tickets from insisted that it was impossible to take a train all the way to Aguas Calientes, but that’s exactly what we did. We used Peru Rail but immediately regretted our decision. Again, their website wasn’t working so I emailed them our reservation. We filled out everything and sent all the photos they asked for, including giving my credit card information, and then never heard back from them. I emailed 3 times, messaged them on Facebook and 5 days later I still hadn’t received a response and certainly not any tickets. I finally called them and explained my situation fearful that they would eventually run my card and I would be charged twice, but we eventually did get our tickets after I called. Since we hadn’t hired a guide, we did our own research and watched documentaries. I felt like I knew what everything was, and when I listened in on other tours I heard 1) wrong information (Machu Picchu is NOT the Lost City of the Incas) and 2) things we had already learned for free. We walked for 3 hours and still didn't see everything. We should have just sprung for the hotel room so we could spend all day there because I really underestimated how long all of the lines would take. Finally we took the bus down and got ready to board the train home. On the way home some malfunction occurred and we were stuck at a sit still on the train for 3 hours- mind you its 27 degrees outside and the train wasn’t keeping us much warmer than that. There was no WIFI or phone service so there was no way to contact taxis and tour companies that were waiting at the Cusco station. When I asked if we would be compensated in some way for the trouble the attendant told me ‘we should have chosen an earlier train’. Finally we arrived home 3 hours late, after midnight (when the taxi fares are much higher) and I immediately contacted Peru Rail to tell them about our problem and insist on a refund. Several weeks later I still haven’t heard anything, so I won’t be holding my breath, but sheesh I spent over $300 on those train tickets! In conclusion, if you need to buy Machu Picchu tickets either do so through an agency or contact me and I can save you a lot of trouble. Most importantly, never trust your trip to one of the 7 Wonders of the World to Peru Rail. Despite all of our trouble the time we spent at Machu Pichhu was incredibly magical. No amount of setbacks would be worth not going. The weather was perfect; we experienced unbelievable things and got to physically touch stones that are an incredible, mysterious, part of history. Plus, I will always remember it as the spot where I said ‘yes!’.